I’ve always liked my rugby. I can’t honestly say I’ve ever been that good at it mind. At school, I was – to put it charitably – an enthusiastic front row forward, shifting to flanker as others got bulkier. Nowadays, I’m confined to non-contact rugby by recurrent injuries. Yet there has always been an interest, for me, in the way in which rugby seems to speak across ages. There’s something fantastically resonant about the whole game, with its long association with amateurism seeming to imbue it with something of a gentlemanly spirit. 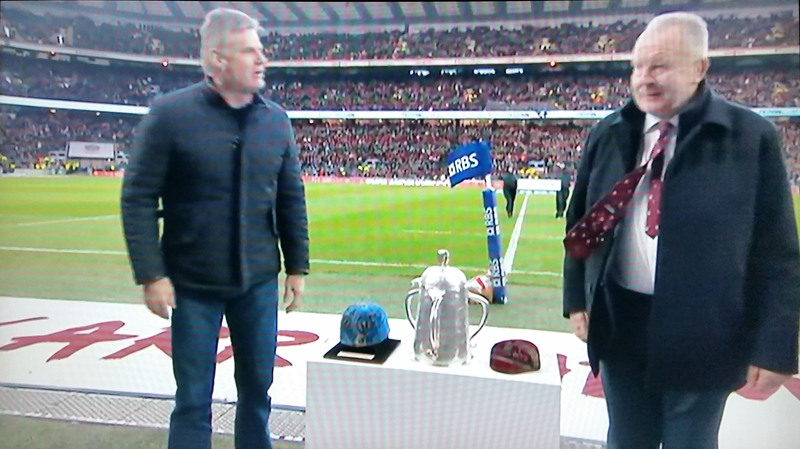 At half-time during the Calcutta Cup match (England against Scotland) on Saturday 14th March Scottish Rugby legend John Beattie handed over the very first Scotland Cap from the first ever international rugby game, to be safely stowed at the National Rugby Museum at Twickenham alongside an English cap from the day. I’d heard about this ceremony the night before, at the London Academical Club dinner, when we were eagerly warned not to recharge our glasses at half-time on Saturday until we’d seen the very special artefact exchanged. It’s worth noting that I played against Beattie’s son, representing Scotland that day, at school, and he was a thousand times the player I was, though also seemed to particularly enjoy dislocating my shoulder (I jest, it does that it in a strong wind, anyway – hence the non-contact rugby). Excuse the photo taken of the telly during the handover! So, the match: In 1871, following a challenge issued in a newspaper by a vainglorious group of Scottish rugby enthusiasts the year before, an English XV met a Scottish XV at the home ground of Edinburgh Academicals. The subsequent match was dominated by those public schools in the central belt that had begun to dabble in this new code of Rugby Football. Chief amongst them was the Glasgow Academy. The cap exchanged last Saturday was that of John W Arthur of the Glasgow Academicals, one of the signatories of the official challenge and also setting up a try scorer on the day (although great play of Arthur’s innocence of an accusation of knock on was protested at the dinner of the Friday). Scotland won the match, although it was still rather quaintly scored. Each try then gave the opportunity for a conversion (then referred to as a “goal”), and it was the conversions that went onto the scoreboard. This meant the match finished 1-0 to Scotland, despite there being three tries in the game (the modern equivalent score would have been 12-5 to Scotland). England wore white, Scotland wore brown and around 4,000 people crowded round to watch. I’m pleased, in a way, that I have some far off connection to this exchange on Saturday and the match it commemorated, having passed through the halls at Kelvinbridge and New Anniesland numerous times in my formative years. Likewise, the involvement of St Salvator FC from St Andrews binds me to it through my alma mater. These early pioneers of the sport spoke of a certain semblance of Victorian masculinity, imbued with virtue, with privilege and with creativity. The launch of the Rugby Union code in the late nineteenth century saw it grow in popularity, even across the Channel. Only 20 years later, the game would spread to the South of France, and start to take on a much more earthy tone. Suddenly, burly peasants bashing each other in defence of the local clock-tower became far more representative of the French game than were the pampered Parisian elites who had been its early-adopters. (If you’re interested in this, you could always read my article “Je suis socialiste et quinziste “: Rugby, Wine and Socialism in the Aude since 1976, or listen to a podcast of me giving a related paper at the IHR by clicking HERE). Writing on the ways in which such leisure activities helped shape both ordinary men and the elites who shaped the modern world (see, in particular, the work of Thierry Terret and Philip Dine), gives us an insight into the values which defined the late nineteenth century. Often the end of that century, or the fin-de-siècle, can seem a distant place, and we as historians tend to discuss ideas of crisis, concerns about science and the dangers of moral and physical ‘degeneration’ (see, for example, Max Nordau or Sandor Gilman). Yet, in the flourishing of these leisure activities, we often see a different side to this period. Far from the fear of the crowd or the mob (as raised by Gustav Le Bon), we see, in a sense, the relish of the ruck and the scrum. Juxtaposing ideas of popular culture alongside broader trends of intellectual history can help to nuance and demonstrate the ways in which people remain people. Swirling trends of modernity, crises of rationality and the headwinds of scientific advance can all be powerful determinants of identity, but so can a knockabout in the park on a Saturday.